This is Henry James -- one of Marie's two rescues. Though he is of unknown pedigree, Marie believes him to be a ridgeless ridgeback, rather than a cross, due to his personality and physical characteristics. Also because he was neutered at two months, then placed in a kill shelter, which is sometimes a response to ridgelessness and is how he came to be with Marie's family. He's quite the mix of exasperation and love-ability. Marie loves his self-spiritedness, but empathizes with others who struggle with this quality. Things that drive me nuts: He is a barker and he is usually overly excited to greet ANYone. Marie thinks the challenge to training is getting his focus. He simply doesn't hear his human when he is fixed on something else -- which is almost all the time. Things that make Marie love him more than any other dog I have ever owned: His view of himself as a lapdog, and the way he sleeps curled up like a baby, happy to be covered with a blanket for the night. Also, you have to admire his athletic ability. He jumps like a gazelle and runs like a lion. She thought her border collie mix, George Eliot, who is a year older, was fast, but Henry outpaces her every time. He is a lean machine. And yes, sight and scent are top notch. Sadly, Henry has idiopathic epilepsy; he's four now and it began when he was three. His seizures are far apart, so he is not medicated, but I am about to put him on a vet-recommended restricted homemade diet to see if that makes a difference. 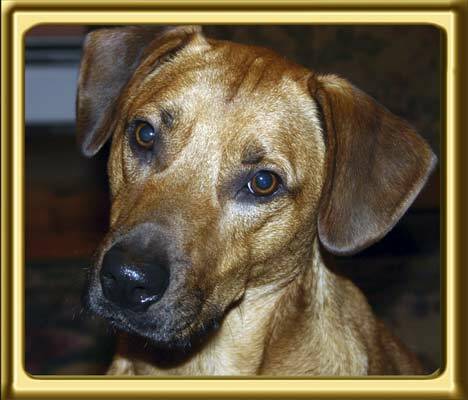 Email your Ridgeback & Ebbey LookAlike Photos with a brief bio & or funny ridgeback story. Playing the search dog, Ebbey has a leading role in the eerie action thriller Search Dog's Raven. Her character is paramount, because the key to unlocking the film's unique twist turns out to be the 'Search Dog's...Raven.